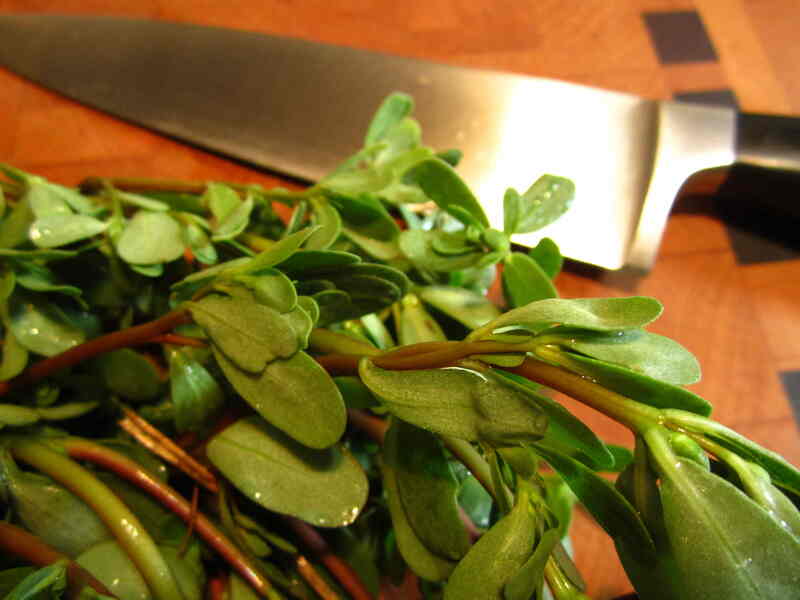 The vendor, an Asian man who apparently didn’t feel compelled to follow American rules about what is a weed and what is a vegetable, knew that purslane (such a dignified name!) is loaded with vitamin A and C, and is delicious in salads and stir fry. He recommended sautéing it with garlic and a pinch of chili powder. Life is always challenging us with parables like that, isn’t it? It plops down right in front of us things that upset our assumptions and doggedly nag at us like a thorn in our mind until we shift our perspective. Purslane’s presence in our plot (forgive me for having a bit of alliterative fun here) has been a parable I’ve been parsing now for weeks. First of all, it’s challenging any vestiges in me of the puritanical assumption that life is all about effort, and than nothing good comes to us except through hard work. This vitamin-loaded plant grows all on its own, thank you very much, without our fussing over it in the least. Heck, we didn’t even need to send away for any seed packets, nor, I’d lay bets, is Monsanto’s research team in their lab trying to figure out how to genetically modify and patent it, at least not yet. Now according to Arla, an Ag teacher we knew in Missouri, a weed is any plant growing where you don’t want it to grow, and the purslane episode has also gotten me thinking about things in my life that I might see as weeds — unwanted and irritating — that might in fact be offering something quite useful if I would only stop rejecting them. Sometimes life circumstances can be like that. Experiences we judge to be unpleasant often turn out to be the very things that enrich our growth. They’re loaded with all sorts of spiritual nutrients that grow our capacity to do very healthy things, like practicing acceptance and letting go. Like now, for instance. The moment I finished writing that sentence a jackhammer started up in the alley behind our house. Now I can tell you for a fact that if I try to resist it, (because, after all, the sound of jackhammers have no business invading the quiet confines of my study!! ), I will soon be tearing my hair out. I’m guessing you know exactly what I mean. One of the most fertile fields this purslane parable invites me to explore isn’t necessarily what’s outside of me, happening in the alley for example, but what’s right here inside of me. In the inner field I encounter a whole host of qualities, some of which I like and some I don’t, and the ones I don’t I often try to reject or resist (futilely, I might add, since, just like weeds, they never really go away). And here’s the crazy thing: oftentimes it’s the very act of resisting them that causes them to thrive. My brother-in-law, Tim, recently told me that if you try to pull a thistle out by the roots, not only will you not succeed in getting all the roots, but you’ll trigger the thistle’s growth response and you’ll end up with more of them than you had before. When it comes to our inner qualities, resistance simply doesn’t work. What does work is acceptance. When we accept all of who we are, including the “weeds,” we become whole. The psychological term for that, if you’re interested, is integration. You might also think of it as digestion. It’s the difference between trying to use the chopping block and the cutting board. The things we put on the chopping block are things we want to get rid of. The things we put on the cutting board are things we intend to take in, welcome, metabolize, absorb into the whole of us, knowing that it will make us stronger. Needless to say, the next time I went to the garden after my farmer’s market discovery, I didn’t throw the purslane onto the compost pile after I pulled it. I brought it home, washed it up, and fixed it for dinner. The Asian farmer was right. It was delicious. brilliant. we have purslane all over the place. who knew?! so i have one question: i hear you about the thistle. so if i can’t pull it up by the root, which, by the way, for me is so gratifying, then how the heck is one supposed to get rid of it?? great post. loved it, as always. Hi Susan. I’m glad you liked the post, and I hope you enjoy the purslane. “These are not easy plants to beat, and… toxic chemical herbicides won’t do the trick. Those poisons are good at killing off single plants, but they don’t affect huge underground root systems—so don’t waste your time, money and life fooling around with them. You’ve totally motivated me to try this recipe I found on-line: saute equal parts chopped purslane and onion before scrambling in some eggs – it’s a traditional Mexican dish called huevos con verdolagas. Lovely wrapped up in a warm corn tortilla. This sounds fantastic, Tim! Kip and I often make our own corn tortillas, which will add an extra touch to what sounds like a great recipe. I’m imagining some salsa or green chili sauce on the side. You’re motivating me to get over to the garden and weed! OK !! We weeded. We have purslane and onions. We have our tortilla press and fresh tortillas. We’re going to make Tim’s recipe (+ a little green chile sauce). I cooked it. We ate it. Yummy ! The purslane adds a nice crunchy nip ! beat two eggs lightly, pour beaten eggs over entire skillet of onions, purslane. cook, flip, cook. When puffed up, slice up to divide into four parts. fold tortillas around the mixture. Add any chili sauce you want (green, red). Tim, in addition to this wonderful recipe you sent, this weekend I concocted a purslane dish that turned out really well. I sautéed some purslane in olive oil, added some fresh cooked corn (cut right off the cob — yum), stirred in some fresh tomato, and some pesto. This is a far cry from purslane weeds but my story is like yours. Losing my car and getting used to riding the bus was a “thorn in (my) mind until (I shifted) perspective”). After 3 months of save travel, traveling by bus has brought me a new perspective. I have amazing conversations with others waiting or sitting next to me, I see things I hadn’t seen before when before I had to watch the traffic and lights. And I get some good reading done on a long ride. While it takes more time in my day it has slowed me down and I saved all that insurance!!! It’s all a part of getting too old to drive. So it grows there too, Noris. I wonder if this is a world wide weed!